VSDs can be of several types. Smaller defects get rectified by themselves without requiring treatment. They also do not display long-term effects. On the other hand, defects that do not close will require surgery for treatment. VSDs are considered to be a very common type of congenital birth defect, as per the National Institute of Health. MRI: It is used mainly to incorporate magnetic waves and radio waves for taking several images of the heart. Echocardiogram: This agitated saline bubble test is one form of ultrasound that gives information about the heart after saline bubbles are injected into the bloodstream. Transesophageal echocardiogram (TEE): In this type of test, the throat is numbed, and pictures are taken. The pictures can be taken only after a thin tube holding a specific ultrasound device is pushed into the throat, near the heart. 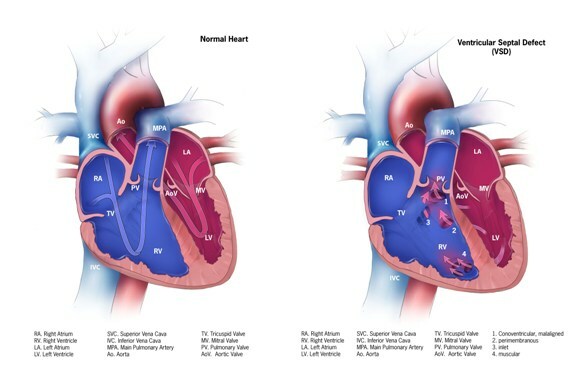 There are several cases when the ventricular septal defect is small and does not result in symptoms. In such instances, the doctor recommends a wait-and-watch approach where time is allotted to verify if the defect gets cured by itself. The VSD will be monitored thoroughly by the doctor to check if the condition is improving. When the cases are more severe, surgery is the best VSD closure treatment in India that can help in repairing the damage. In most cases, open-heart surgery is opted to rectify the condition. The patient is anesthetized, and a heart-lung machine is attached to him/her. The surgeon makes an incision in the chest, very close to the ventricular septal defect with the patch or stitches. In the catheter procedure, a catheter or thin tube is inserted in a blood vessel located in the groin. It is then guided all the way till the heart in order to close of the VSD. There are other surgeries available as well. But, they mostly involve a combination of the catheter procedure and open-heart surgery. In cases when the VSD is very large, medications will be necessary for controlling the symptoms before undergoing surgery. The doctors might prescribe Digoxin, one of the common medications, for controlling the symptoms. The drug is prepared from the foxglove plant named Digitalis lanata. When small VSDs are seen in babies with zero symptoms, the doctor will be monitoring the kid constantly to check if the defect closes by itself. It is important to see that symptoms do not show up. Surgeries are known to have excellent long-term outcomes and high success rate.